Polona Florijančič is a female Slovenian student studying Human Rights Law at Brunel university in London. Polona is petite and so delicate that I always have to remind myself not to embrace her too hard. Don't let her size fool you though, for she has a heart of a lion when it comes to standing up to tyrants. Polona has been an active and passionate supporter of the Green Movement in Iran right from the beginning. She is a familiar face to Iranians in London and can be seen at most major events in support of the Green Movement. Polona was on a study trip to China with her university last week and last Saturday coincided with the anniversary of the election frauds in Iran, she decided to hold a protest outside the Iranian embassy in Beijing with her Swedish friend and fellow student, Kahina Bakhti. 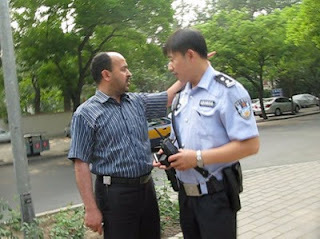 Ahmadinejad was also in China at the time, so holding the protest was even more significant. 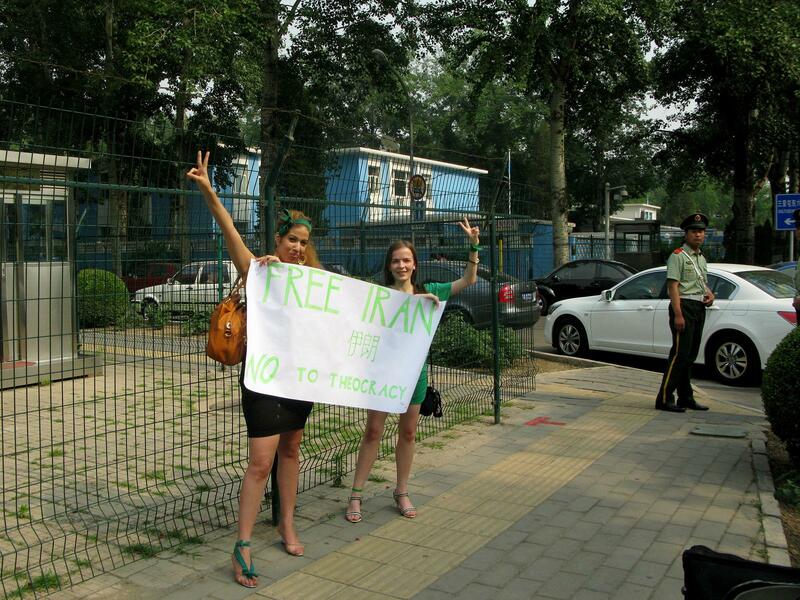 Together they simply held a placard that said in English 'Free Iran, Say NO to Theocracy'. To the intolerant embassy goons even this was too much. They could not believe at first that even in Beijing people were protesting against them. 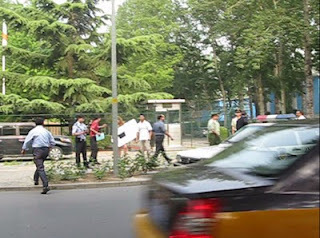 After their initial shock was over, several Iranian looking agents appeared from nowhere as well as from inside the embassy to stop Polona and Kahina. 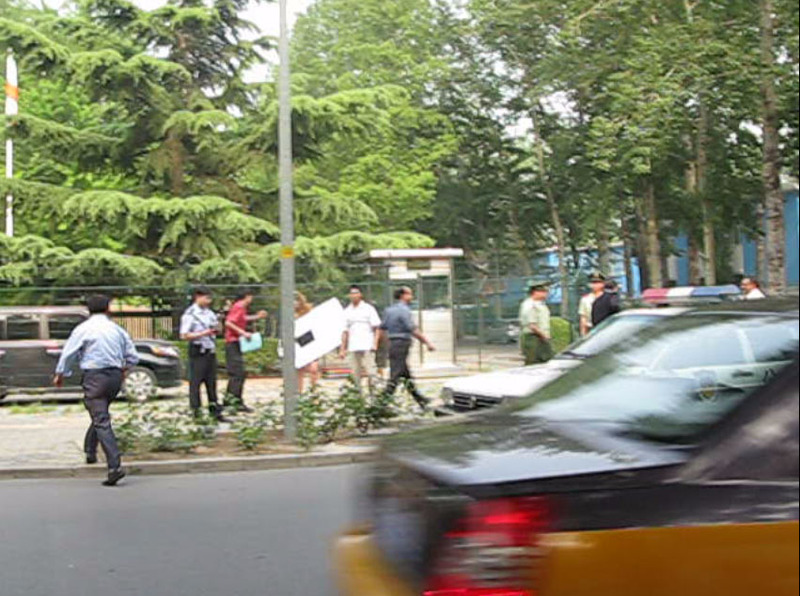 The embassy goons demanded the Chinese police to arrest the protesters. One of them kept telling the Chinese police 'They are not even Iranians, They are not even Iranians' as if non-Iranians don't have the right to protest against human rights abuses in Iran. He kept staring at Polona with a cold blooded killer look to intimidate her. Polona and Kahina resisted as long as they could until two Chinese police cars took them away. As little Polona sat in the police car she shouted at the embassy goon with the killer look stare, 'You can torture your own people but you can't touch me'. Polona and Kahina were each interrogated by two Chinese interrogators who spoke English but knew nothing about Iran. - What is an Ayatollah? At times the interrogators would warm up to them when they listened to what had happened in Iran in the last year. 'You are right, Theocracy is no good'. Polona and Kahina returned to London, Heathrow on Thursday to a hero's welcome by the supporters of the Green Movement. 'They are not Iranians' but we are now one big global family who will push for democracy and human rights in Iran wherever we are, and we will look after everyone of this extended family, whether they are Iranians or not! Well done girls... Glad you're safe and that it all ended with a certain amount of humour. All except for the Iranian goons of course, who once again had their smug smiles wiped from their fearful faces! Why were these girls arrested in the first place? They were not doing anything wrong. Thank you Polona and Kahina. You are an inspiration to all.